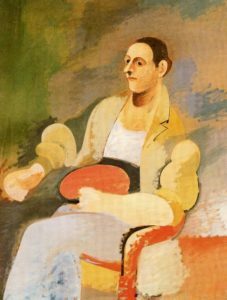 Arshile Gorky (1904-1948), was a talented Armenian born American painter who is regarded as the connection between American Abstract Expressionist movement and the European Surrealist themes in painting. 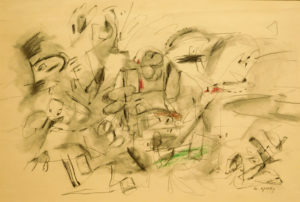 His mature sense of spontaneity was decades ahead of his time and influenced artists that followed in his footsteps, including Willem de Kooning, Mark Rothko, Jackson Pollock, Robert Motherwell and others associated with the New York School. Vosdanik Adoian was Gorky’s given name but he changed it in 1924 when he moved to New York. He was born in Turkey in 1904, but emigrated with his sister to the United States, escaping the civil unrest in that area. He briefly lived in Rhode Island, studying at the Rhode Island School of Design, and then at the New School of Design and Illustration in Boston, before moving to New York. He started teaching at what is now known as the Parsons School of Design, where Mark Rothko was a student, and began frequenting museums and galleries in a focused, self-study. He pored over the work of masters like Cezanne, Picasso, Miro and Kandinsky, and obsessively translated all he absorbed into an unique style inspired by Cubism, Surrealism and his own childhood memories. He tragically lost his mother as a result of the ethnic cleansing in his home town, but he never forgot her or the impression that country left on him. How My Mother’s Apron Unfolds in My Life, 1944. 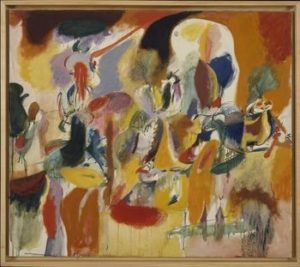 Gorky was successful as an artist in New York and in 1941 married young Alice Magruder, known as Magoush, with whom he had a family. 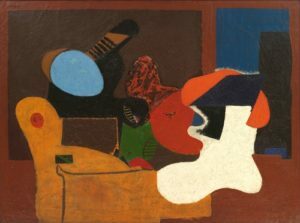 They lived on a farm in Connecticut where Gorky hit his stride with his work. This productive period was short lived however, as a string of tragedies affected him; a studio fire, then a diagnosis of rectal cancer, and finally a car crash in 1948 that left him with a broken neck. By the middle of that year, Gorky had descended into a deep depression that culminated in him taking his own life at the age of 46. 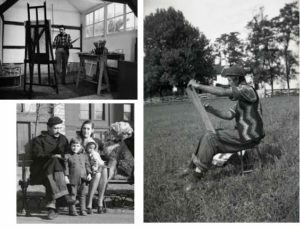 The artist In his studio, plein air and with his family. 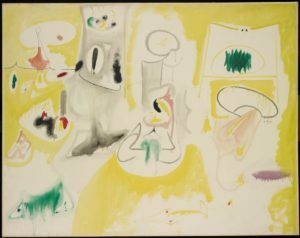 Arshile Gorky’s influence on the New York artists was profound. Within four years of his death De Kooning, Rothko, Clyfford Still, Barnett Newman, Robert Motherwell and Jackson Pollock were experiencing unprecedented success. As Cy Twombly, one of his most distinguished successors, observed, “Gorky would copy a drawing into a painting.” Always, whatever the scale, however colourful the polymorphic hubbub in a painting might be, he had been there before with his sharp pencil, marking the score. Currently at the Woodshed Gallery, we have two signed drawings, done in graphite and colored pencil. One of them is dated 1944, the other is undated but is very similar, and likely was created around the same time. 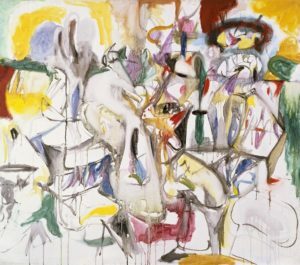 Earthy and organic, the amorphous shapes suggest the very essence of nature itself – as Gorky saw it. 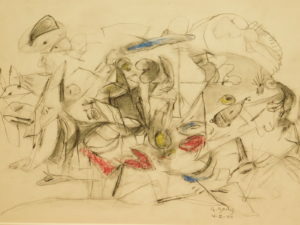 Drawing signed A. Gorky, 1944.